When severe weather hits, The New York Times has a knack for signing up just the wrong movie sponsor for its Web site. A few weeks ago, the “article tools” in stories about the floods in upstate New York were sponsored by the movie Water. This week, every story about the heat wave carries the logo of Little Miss Sunshine. 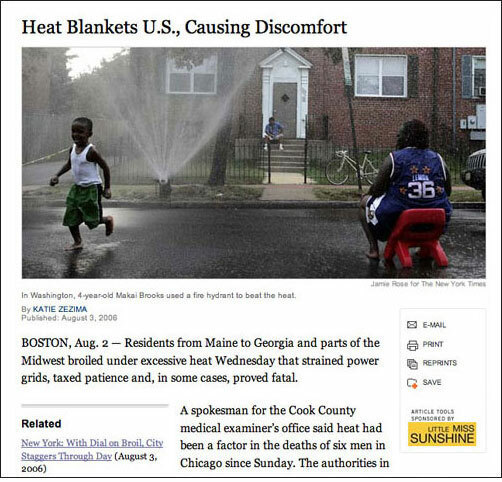 Which would be humorous if the story here didn’t mention six heat-related deaths in Chicago. Whether these article tools even need sponsorship is another question.